For fishing you need a serious unit which gives you a unique experience. No need to waste time in installing and disconnecting the unit. The Humminbird 409440-1 688Ci HD Fishfinder & GPS Combo is also able to be upgraded with with technology advancements. It is optional to connect the unit with PC. 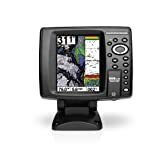 The Humminbird 409440-1 688C is a fish finder with a good GPS which is a designed for some serious fishing tours for high-quality tools for use in any water; salt or fresh. 688ci is not only manufactured for sports fishing but all kinds of fishing tours. This fish finder is ideal for people as it is not only perfect regarding features but also regarding cost. Using this unit is also an easy task. It is designed for helping people in getting best fishing experience. Just take this tool this weekend and go on out of the world of fishing experience. There is a backlight on the Humminbird 688Ci HD Fishfinder & GPS Combo which illuminates the area for better viewing. A single SD card is located on one side of this tool which allows you to save snapshots and recordings for using it later. Quick Disconnect feature is also added in this unit. You can easily disconnect the mounting system and install this mounting tool with the unit. The software of the 688ci can also be upgraded so that you can enhance the performance of your tool and fishing experience as well. Simply take the piece out of the box and assemble it in a couple of minutes. Humminbird has been building recreational fishfinders from last 20 years. Purchasing 688ci is a long-time investment. SwitchFire Sonar has also installed in this unit that deals with way sonar returns appear on the screen. There are two main modes of the unit including Max mode and Clear mode. DualBeam Plus Sonar offers two different beams to fishermen; narrow beam and wide beam. Through wide beam, you can extend the area of viewing while through narrow beam you can pay attention to any single point. 688ci has a 5 inches HD screen which give you 480H x 640V. Explore what lies below your boat. An LED backlight allows you to view fishes in every corner of the sea. All the buttons for quick settings are given on top of the unit so that you can access those buttons easily. Digital readout meter is given which makes its readability easy. You can also take snapshots along with recordings of the sonar and save those things in SD card. Therefore, 688ci is a long-time investment.